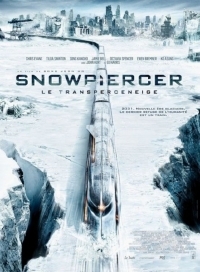 In the year since the announcement that TNT was moving forward with a pilot based on Snowpiercer, writer Josh Friedman ("Terminator: The Sarah Connor Chronicles," War of the Worlds, Avatar 2) wrote a pilot which Scott Derrickson (Sinister, Doctor Strange) directed and - from today's news - which TNT must have really liked because the network has confirmed that they were moving ahead with a series order for the show. The entire discussion surrounding this project is focused on the series being based on Bong Joon Ho's movie from 2013 though Joon Ho adapted his film from a French graphic novel - with some liberties. Seems the show will continue with Joon Ho's take on the story which unfolds seven years after the world has become a frozen wasteland and centers on the last remnants of humanity living aboard a constantly moving train. As previously announced, the series will star Daveed Diggs, along with newly minted cast mate Jennifer Connelly and supporting cast which includes Mickey Sumner, Susan Park, Benjamin Haigh, Sasha Frolova, Katie McGuinness, Alison Wright, Annalise Basso, Sam Otto, Roberto Urbina, Sheila Vand, and Lena Hall. No word on when production of the series will begin or when it is expected to air.